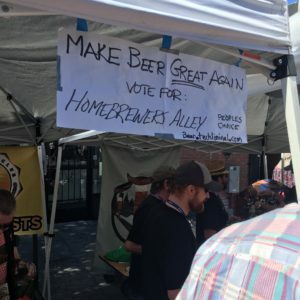 Thank you 2018 German Style Homebrew Competition submissions. Stay tuned for 2019 competition. Stay Brewing ! Are you a professional masher or a just-for-fun fermenter? Are you interested in feedback to help you on your way to Craft Perfection? Enter our challenge and get tasted and judged by people who know how to drink! Presented in conjunction with the Bay Area’s own Mad Zymurgists homebrewing club. For complete entry details including: important dates, competition rules, entry forms, drop-off locations, and styles accepted, visit the Mad Zymurgists’ competition page. Congratulations to our 2016 Winner, Stan Gardner! Congratulations to our 2015 Winner, Keith Kost of San Francisco Homebrewers Guild! Congratulations to our 2014 Winner, Daniel Owens of the San Francisco Homebrewers Guild! Thank You to Hop Yard Ale House & 21st Amendment Brewery for being our trusty judges!